After a long time also in Bratislava a concert in the style of the Viennese New Year’s tradition will take place. After the two successfully sold out Christmas Concerts, Hilaris Chamber Orchestra under the direction of Alan Vizváry prepared for the audience in Bratislava an Epiphany Concert, which will be held on Sunday the 6th January 2019 at 6 pm in the Moyzes Hall in Bratislava. The programme of the concert with the subtitle „Strauss Waltz Evening“ is composed of waltzes and polkas of the Strauss dynasty. The selection of composers is not incidental. The HCO will invite also artists from Vienna and Members of the Ballet Ensemble of the Vienna State Opera to the stage. With Epiphany the Christmastime ends and the carnival period begins. The Strauss dynasty created in Vienna a cultivated and noble musical entertainment. Their waltzes, polkas, quadrilles and gallops are admired worldwide up to this day thanks to many generations of musicians of the Viennese School, which brought their interpretation to perfection. Also the violinist Alan Vizváry belongs to them. He is pupil of the legendary concert master of the Vienna Philharmonics Gerhart Hetzel and his long-time performance on the Vienna stages makes him a devoted interpreter of this music. The Epiphany Concert of Hilaris Chamber Orchestra at 6 pm is sold out! 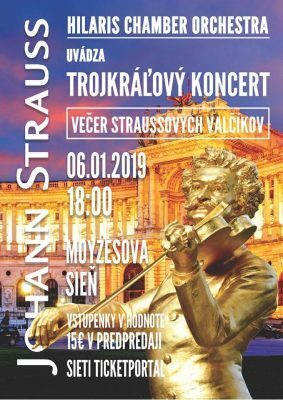 Due to great interest there will be another Epiphany Concert added at the same day 6th January 2019 at 3:30 pm in the Moyzes Hall in Bratislava. Tickets are available at the price of € 15 in Ticketportal network. One hour before the concert on site, you can buy tickets at the price of € 20.